KLEIN developed a new sand filling spout which is particularly suited for the limited space requirements in rail vehicles. This new filling spout can be located e. g. in the car supporting column between the windows. The hinged cover is smoothly fitted into the front, i. e. it does not protrude the carriage facing. Since the cover opens to the top, it cannot open unintentionally en-route, should it not have been closed properly. Snap lock: The cover can be closed without using a square spanner. Square lock, protection class IP 66. 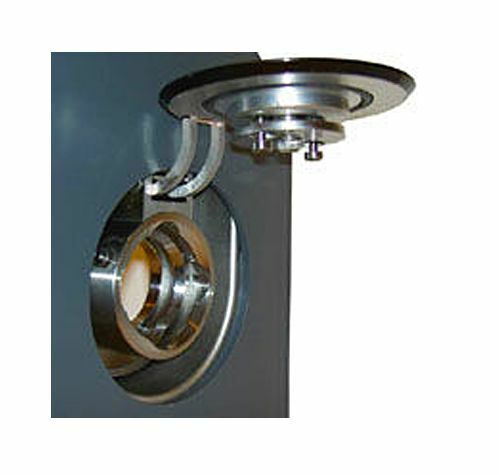 If required, a variety of other locks such as triangular, radial bolt, two-way key etc. can be employed. Optional with aeration valve to balance the air inside the sand box during the sand scattering process. 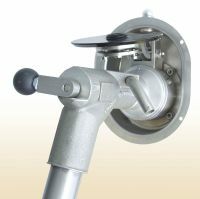 The aeration valve is open when the cover is closed and closed when the cover is open during the filling process so that no dust escapes. Instead of the aeration valve the cover can also be equipped with an overpressure protection. 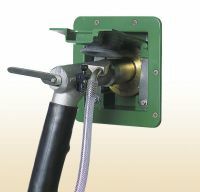 The innovative sand filling nozzle can be connected to the filling spout by turning it by 45°.